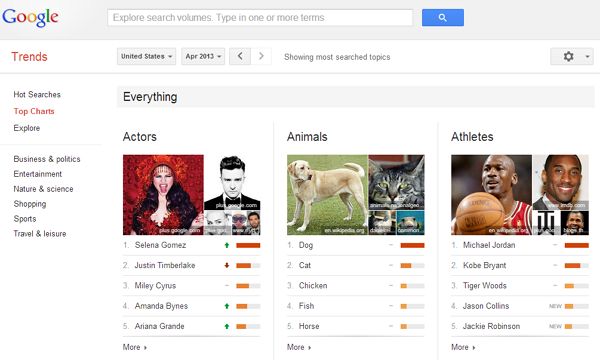 Google adds monthly "Top Charts" section in Google Trends. Top charts shows you can top 10 most searched things in every month with 40+ different category like Movies, Sports and Peoples. For example if you click on the Top charts on Google Trends, now you can see top 10 most searched peoples things in April such as peoples, movies and more. You can customize hot trends layout by clicking icon on top left corner. And also Google updates minor changes in Trends user interface.